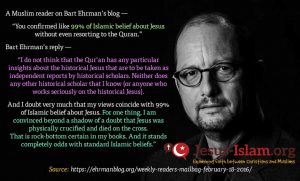 Jesus-Islam » His death » What does history tell us about the death of Jesus? History confirms the crucifixion of Jesus. There are non-Christian writings, contemporaneous with the time of Jesus, dealing with the question of the person and the crucifixion of Jesus as historical events. We have here mentions gathered from sources other than the Bible and which are very clear on the death of Jesus! The crucifixion of Jesus is an event well known and attested by history. The historians of modern times are unanimous in retaining: Jesus was crucified. In one of these books, Abbas Mahmoud Al-Akkad, a highly respected Muslim Egyptologist and scholar, confirms that we can rely entirely on the narrative of the four Gospels of the Bible (Matthew, Mark, Luke, and John) Which he considers to be faithful accounts of what happened to Jesus.